No aircraft markings in history are more iconic than the distinctive shark's mouths applied to the noses of P-40s and P-51s flown by the AVG and 23rd FG in the skies over Asia during World War II. This book covers not only the camouflage and markings of the fighters they flew but also the combat history of these legendary units. No aircraft markings in history are more iconic than the distinctive shark's mouths applied to the noses of American Volunteer Group and 23rd Fighter Group P-40s and P-51s that fought in the skies over Asia during World War II. This book covers the camouflage and markings of the fighters they flew, including the first detailed account of the progression of markings changes made by the 23rd FG throughout the war, as well as the combat history of these legendary units. It features over 100 rare period photographs, plus 32 fully researched, full-color plates showing different aircraft types employed by the units across different camouflage patterns, with very detailed captions and reference photos. Over the past 35 years, the author has written more than a dozen books and numerous magazine articles about USAAF fighter operations during World War II. Contains: 64 pages, 105 b&w photos, 6 color photos and 32 full color plates of artwork. 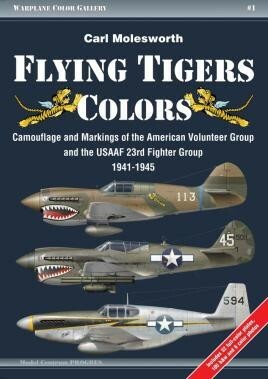 Flying Tigers Colours will appeal to both air historians and modellers alike, and will form a very useful reference for anyone interested in the units and their aircraft. In all, it makes for a superb read and a book that I found quite interesting...Highly recommended. If you have an interest in aircraft of the CBI or the Flying Tigers, Carl Molesworth is the author you should seek out. I consider him the undisputed champion on the subject matter. I highly recommend this book for your research library.